Star Wars Destiny Rivals - My thoughts on the new Draft format — GamingWithSwag.com - Dads By Day, Gamers By Night. 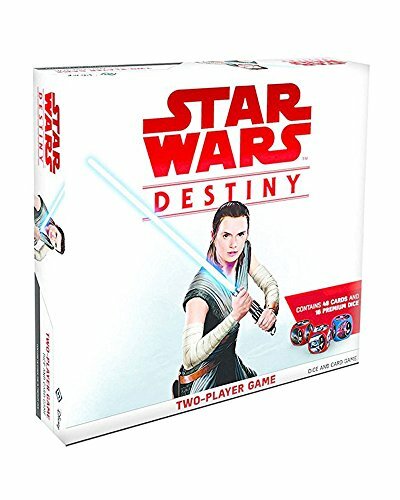 Rather quickly after announcing the next Core set for Star Wars Destiny, Fantasy Flight have announced a draft format set called Rivals which will contain for the first time Neutral affiliation players that can be paired with whatever Heroes or Villains you draft from a collection of boosters. Me and my friends tried to do a draft format game with an Empire at War box where we each opened 9 boosters and tried to form a team, and none of us could field a functioning group. I got almost exclusively weapons and abilities and we ended up deciding to just play with regular decks. The draft format is a traditional growing point for any collectible card game, and for more casual players who like the challenge of making a team but are tired of losing against over powered teams heavy on high dollar cards this is a natural refuge. The downside is that this format may be pricey. Right off the bat 6-8 boosters is $18-24 dollars and the Rivals pack is $15 making this game roughly $40 bucks a person to play. For those of us who love the game, it makes a game out of opening the packs we already knew we would be buying allowing us to savor the moment. New players might balk at the price though. Some stores may have Rivals packs available to borrow so newbies could just buy the boosters and give the game a whirl but I know few places near me willing to risk such a thing. I love more ways to rope people in to my new addiction though, so lets stay positive. The Rivals pack comes with some excellent starter characters that I would want regardless of format including our first 6 cost character in the Jawa. I have had a few deck ideas that needed a 6 point character to fill out and I am glad it is now a reality. In fact the neutral characters might be too good because you may not want to use your drafted players over them especially Anakin who is amazing for such a low cost. I imagine you will need two Rivals packs to run them at elite, and looking at the characters I think most players are ready to shell it out. I had Jawas in my list of characters I would like to see but looks like I will have to wait a little longer for any others. Besides Anakin, who can be a Shield generation machine for a hero deck or a beater for villains you can pick Lobot, Lando's trusty assistant who is a wonderful support character and the special allowing you to increase any die face makes him perfect for any type of strategy from combat, milling cards, or resource generation. Ketsu makes a sweet weapon that doesn't have re-deploy move over if they kill your main character which could be amazing. Milling hard with the Vibroknucklers and sad to see them go, or want to keep the Vibroknife in play to invalidate their shields? She can use them now. And the lastly we get our 6 cost non-unique Jawa. Buy 5 Rivals sets and you can field an army of Jawas for the only 5 character team possible. I can't recommend it, but who would expect such a thing? They are what you would expect from a 6 cost, namely a crappier Storm Trooper but the ability allows for desperation resource generation and if that allows you to launch a high cost support you may learn to love the little guy. Personally, I love building weird and new decks, and this opens up a bunch of options so I am excited. My wallet isn't though, but maybe it will come around after it sees some nonsense like a Jawa with a re-deployed lightsaber finish out a win on his own.